As you go through the de-cluttering process, you’re going to find things that you’re simply unsure about. Should you keep it? Should you get rid of it? It’s not something essential… but you can certainly see yourself using it again. Quite often, people end up putting items like this right back where they found them. They can’t talk themselves into getting rid of this item that they’ve rarely used, but there’s some sort of redeeming value to it. Maybe it’s a movie that you used to really like. Maybe it’s something that reminds you, for some reason, of a happy time in your life. Whatever it is, it’s just enough attachment to convince you to keep something that you really shouldn’t be keeping. I learned this the hard way. The first time I purged our DVD collection, I wound up saving a lot of DVDs because I really liked the movie. What I realized over time was that, even though I really liked the movie, I simply wasn’t putting the DVD into the DVD player. The solution to all of this was simple. I just put all of these marginal items – DVDs and other things – into a box and put a “sell by” date on the box. It’s pretty easy, really. Just pick a date six or twelve months into the future and write “Sell By:” followed by that date on the side of the box. Over the next six or twelve months, if you find yourself actually wanting an item that’s in the box, dig it out and don’t put it back. The item has shown itself to be useful enough to you for you to use it. If half a year or a full year has passed and you haven’t touched some of the items in that box, there’s no surer sign that you should simply get rid of the items. Sell them, donate them, give them away – they really don’t need to be taking up your space. 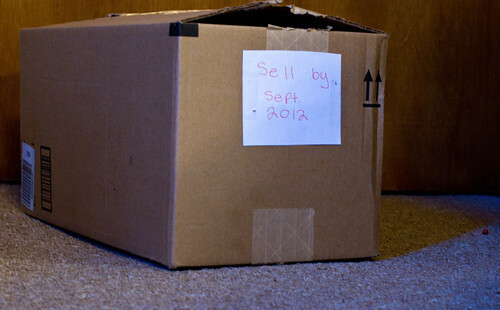 Whenever we do a big “spring cleaning” or “fall cleaning,” I often find myself creating a “sell by” box. I’ll come across an item, think “Hm… that’s cool, but I don’t use it much,” and then toss it into that box. Most of the time, I never pull anything out of that box. The items in there really don’t fill any role in my life. The only reason I didn’t get rid of the item the first time is pure sentiment, and sentiment is an emotion you can keep whether you have that item or not. Clear out your clutter. If you’re unsure, put it in a “sell by” box. When that date comes, sell whatever is left in the box without worries.